Tennis elbow is more properly called lateral epicondylitis, and it is basically a strain of the muscles which bend your wrist back. The name derives from the fact it was observed in amateur tennis players who spent a whole training session working on their backhand stroke, and then woke up the next morning with an extremely sore elbow! Although the muscle affected moves your wrist, the body of the muscle is much further up your forearm towards your elbow. If you repeatedly use any muscle, then you risk damaging it by causing microtears in the fibres of the muscles. You might be surprised by the movements that can cause it in this muscle – one of the most common ones I come across is people who have spend a weekend doing something like putting up shelves, and through repeated used of a screwdriver they have injured this muscle. It generally presents as tenderness on the outside aspect of the elbow. Treatment is fairly straight forward, but it can be slow to heal as it is very difficult to rest the muscle in order to allow it time to heal. Essentially, your Chiropractor will work with the soft tissue of the muscle, trying to prevent any adhesions forming in the muscle and improving the circulation to the area to promote healing. They will also ensure all the joints in the area are functioning properly so that there is no unnecessary strain on the muscle while it is trying to recover. You will also be asked to perform a simple stretching motion during your day to day activities, to help promote healthy healing. The danger while any muscle is repairing itself is that the scar tissue which forms is likely to contract the muscle, making it prone to re-injury because it is tighter than it should be. It is therefore important to help it heal to the correct length and this is done through stretching. 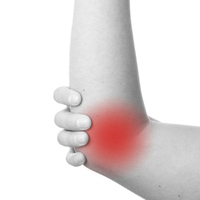 While we’re on the subject, there is also a matching complaint known as “golfer’s elbow” or medial epicondylitis. It is exactly the same process, but with the muscles that curl your wrist in rather than flexing it back – in other words, instead of feeling the pain on the outside aspect of your elbow, you feel it on the inside. Treatment is the same as for lateral epicondylitis – make sure the joints are moving as well as possible, work with the soft tissues in the area and a home stretching program.